Orange is sweet, juicy, full of vitamin C and, surely, every womans nightmare if its look appears on her thighs (yes, I am referring to cellulite). 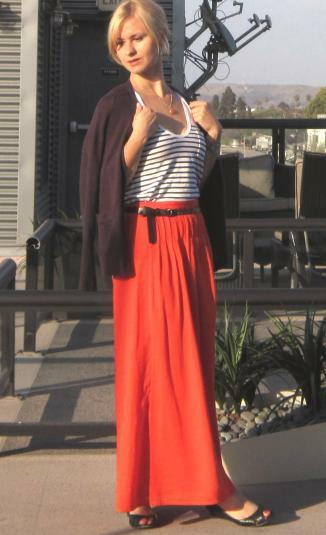 This spring, however, orange is going to claim a new position into our lives, specifically in our wardrobes. Not the actual fruit but its color, as it is one of the warmest and friendliest colors that can look super stylish in all of us. The color orange is here to remind us that it is time to wake up from our winter hibernation. 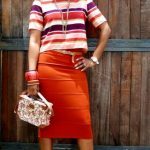 It will provide that boost of energy and cozyness we need to jump into spring and summer and at the same time stand out from the fashion masses. If you look around you, you will notice that the things we need to pay attention to are colored in orange, like life vests, police warning signs, prisoners! It is a color that will get you noticed. 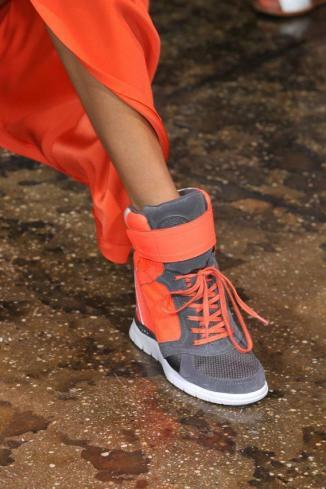 Orange shades were spotted all over the runways for spring-summer 2014 fashion shows. Designers used from vibrant bold orange to soft pastel orange undertones to create a variety of statement pieces as well as makeup inspirations. 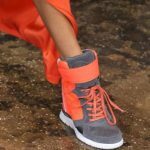 Christian Dior’s pastel orange jacket, Carolina Herrera’s gowns, Suno’s metallic orange dresses, Mulberry’s floral dresses and John Galliano’s orange statement lipsticks are only a few of the runway appearances it made. You may think this color is a bit tricky to wear correctly since you can easily end up looking like you have “just escaped from prison and had no time to change”. Plus, you cannot help but wonder how can a color which is full of character on its own, combine with other colors. 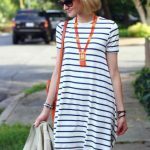 With stripes: Navy stripes are and always will be a summer theme (whether we own a boat or not). The most common, and boring I have to admit, way women wear this theme is with white and blue. Isn’t there anything we can do to make stripes more interesting? Orange says we can. If you want to stay on the safe side of things, add orange to a clean cut navy look either in a handbag or a beautiful eye-catching necklace. 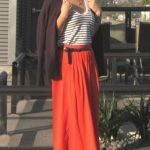 Those that seek a fresher look can match an orange pleated long skirt with a navy striped top or even better, play with multicolored stripe patterns. 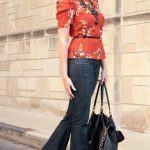 With denim: I love denim and I know many of you do to. Does it match with orange, though? Well, the truth is they make a wonderful combination as long as the color of the denim is either dark or soft blue. The in-between blue shade is too blunt even for such a vibrant color. A pair of jeans with a bold orange top, a denim dress paired with a pastel orange jacket are wonderful combinations that make the orange stand out while keeping the look in perfect balance. With black & white: Black and white are the colors that usually go with everything. This, however, does not apply fully to orange. A pair of orange jeans looks perfect with a white top but, personally I think, they look terrible with a black top. There is a very thin line between looking good in an orange-and-black only outfit and a Halloween advert. Still, if you add a bit of white to that combo the look is mastered to perfection. With vibrant colors: Too many vibrant colors are not a match made in heaven, right? Actually, and this is the only time that I will agree with it, it is. A blast of tangerine looks absolutely amazing with pinks and purple. Many say that yellow is good too, but I think orange and yellow are too “the same” and their match is not really that interesting. With neutral colors: The safest option is this. 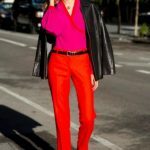 Even an orange casual dress can be worn “silently” if everything else is in neutral color, or a bold orange jumpsuit; a perfect look for a perfect summer. 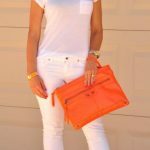 As accessories, bags or shoes: If you don’t feel brave enough to wear this color, or are not from Holland where orange is their national color, you can try to add it to your outfit by adding some accessories, a nice orange bag or a pair of vibrant orange trainers.